Husbands and sailors of the Internet world – this is not the blog post to convince your spouse that the sailing life is for you. The liveaboard lifestyle is still very new to us. It’s only been a week. And, I can’t speak for my husband. But, as a mom who is committed to making this adventure work, I am surprised that living on a sailboat – an emblem of freedom – provides me with a genuine sense of confinement. As a small example, Skipper Mark Burton recommends that, when the gas is on, the stove or oven should never be left unattended. A fire could be catastrophic. I hadn’t anticipated babysitting the stove. I had planned to spend my days homeschooling our kids. But, I also thought that I’d be looking windblown and my fingers would be tender from handling the lines. My primary role is ensuring our kids are safe and fed. I dabble and help anchor the boat. Today, I steered the boat for about an hour. But, our kids are young enough that they like to push the boundaries of safety. They are ages 9, 7 and we have 4 year-old twins that require constant monitoring. For me, going to the bathroom requires a coordinated effort. When nature calls, I must announce my intentions to the closest adult or teenager and have them watch our children so that they don’t escape out the saloon door. Working in my favour, but much to my shock, is the realization that my children seem to prefer the great indoors. While sailing, my kids could literally watch television full-time, on repeat. Turn the television off, and they will draw or play Lego. I suppose this indoorsy attitude bodes well for homeschooling. But, for God’s sake, children – let’s go outside and feel the wind between our toes! In case anyone is wondering – going outside with four children in life jackets, or harness and tether requires a basic level of co-operation from each child. Otherwise, it feels and looks like you are capturing a calf at a rodeo. It is an experience akin to putting a child in a car seat when they are in a full-on tantrum – with legs and arms going in all directions. Yes, my reaction to our new lifestyle is not all roses. Perhaps my attitude can be attributed to the fact that we have just moved from a house situated on 5 acres of property. Add to that the heat of a Florida summer, constant threats of hurricanes, an ongoing refit, and upcoming homeschool plans, and we have a recipe for stress that would fluster most change-management professionals. Fortunately, I remain excited about traveling as a family. And, despite my complaints I haven’t lost sight of the bigger picture. I feel very fortunate to be able to sail. We visited Picnic Island where our kids held horseshoe crabs, made friends, and observed palm trees and pelicans. Karen (age four) has learned to swim. She can now dog paddle the width of a pool without a life jacket. Today, we jumped off our boat into warm green water. The highlight of our swim was when a dolphin swam within 10 feet of our 7-year old son, Paul. We celebrated our niece’s 17th birthday aboard our boat, complete with a freshly-baked cake. My husband, Rick, and I sailed without Mark one morning – which gave us a boost of confidence. Mark helped to move the vessel called ‘Floating Chapel on the Bay.’ It was an unusual experience and sight to behold. 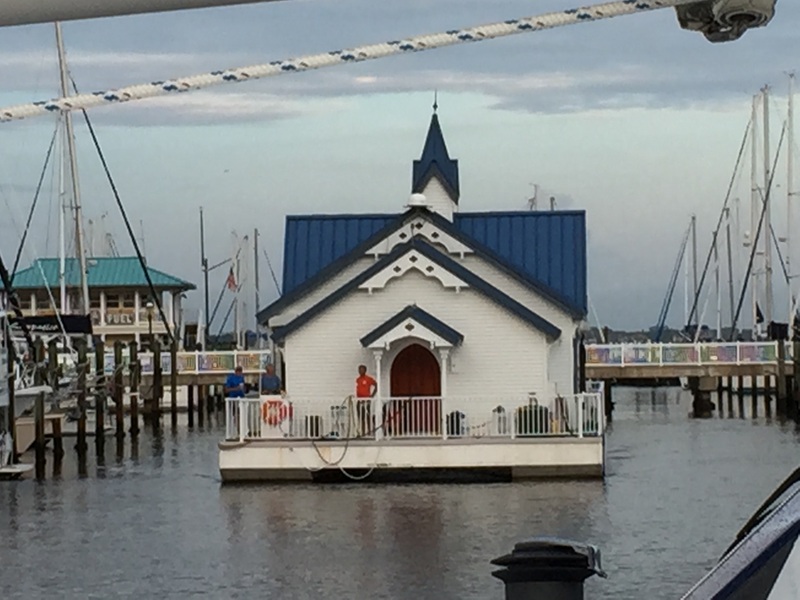 Floating chapel leaving our marina. 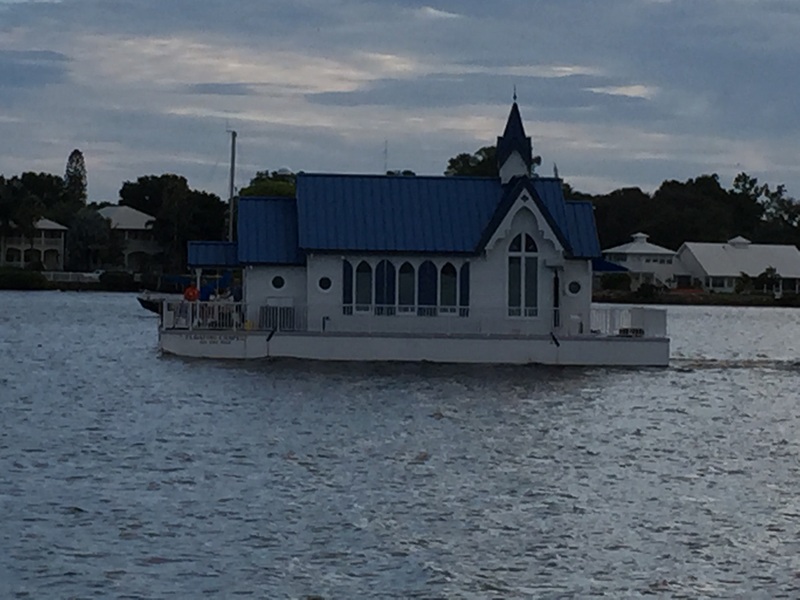 Floating chapel on the move. 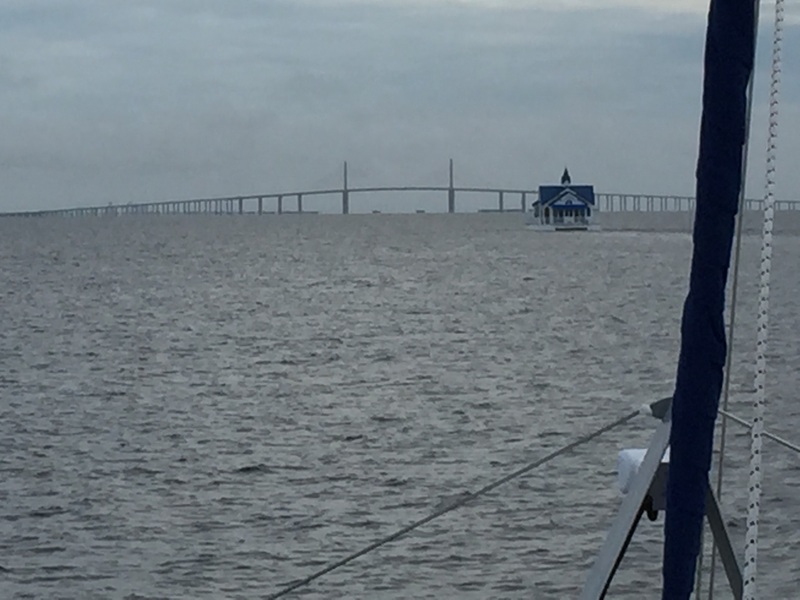 Floating chapel as it nears the Sunshine Skyway Bridge in Tampa. I am realistic that moving aboard is going to have its lumps. I expect it could take upwards of a year before we settle into our new lifestyle. Having Mark aboard has really helped with our transition as a family of liveaboard cruisers. Previous Great Scots, 20 knots! What an inspiration! I have a cat and a husband to wrangle into the love aboard lifestyle. I cannot imagine kids as well. Wow it sounds like you are starting a great adventure. I like the fact that you have been very honest with this post. Good luck for the weeks ahead.